Do you want us to call? Just send an email with your phone number to > service@shoes4gentelmen.de with your name and a brief note about your request. > BUSINESS INDIVIDUAL . Business Classic stands for the more traditional, classic shoe models. Business casual shoes are ideal for an office day or after work events and the category Business Individual offers the slightly more extravagant and more individual models. So you can quickly get an overview and find the business shoes that best suit you and your preferred clothing style. In > Collection you will get a “quick overview” of all our shoe designs. Due to technical reasons in the manufacturing process like individual coloration of leather, as well as manual finishing such as polish and decoration can cause small deviations in appearance between illustrated product photos and actual delivered shoes. Comfort In order to guarantee maximum performance during a business day, you have to feel comfortable. This is why our shoes offer both: an attractive look and comfortable wearing. This is particularly challenging during the summer season due to higher temperatures. All our men’s shoes are made of natural materials (100% leather or textile combined), which support an optimal foot climate. Also when you have to stand for a long time on a trade fair for example. The wearing comfort is essential for your well-being. In this case a strong sole compensates a hard ground. Our 3 series are equipped with up to 10 mm sole thickness and many models have an extra comfortable foot bed. When you enter your data in our web shop, it happens via a secure SSL connection. This ensures that your data can not be accessed by unauthorized persons. When purchased, you will receive your new shoes at your home address by DHL. Delivery to another address of your choice within Germany is also possible. When your order has been shipped, you will receive a shipping notification via e-mail. In the shipping confirmation, you will find your DHL tracking number. This way you can check the status of your shipment at any time. If your size is available, the delivery time in Germany is to average up to 2 to 4 business days. The delivery time to EU-Countries is usually 6-9 business days. The exclusive design of our men’s business shoes focus on an attractive look and offers the right choice for every occasion – no matter whether > BUSINESS CLASSIC , > BUSINESS CASUAL, or > BUSINESS INDIVIDUAL . This way you always leave a stylish impression. Our 1xx- and 2xx-series shoe models have a rather “normal” shape. Our 3-Series (3xx) is a slightly wider shoe shape. Not extra wide, but you have good space. For further information and suggestions, please send an e-mail to > service@shoes4gentlemen.de . A pair of well-chosen shoes can give even a neutral suit the special kick. Your personality and your personal look will be highlighted in a very positive way. On the opposite side a pair of poorly selected shoes can make a good overall impression fail badly. That is why our designs are made for individual business men who dare to present themselves strong. For those who do not want to be lost in the anonymous crowd. 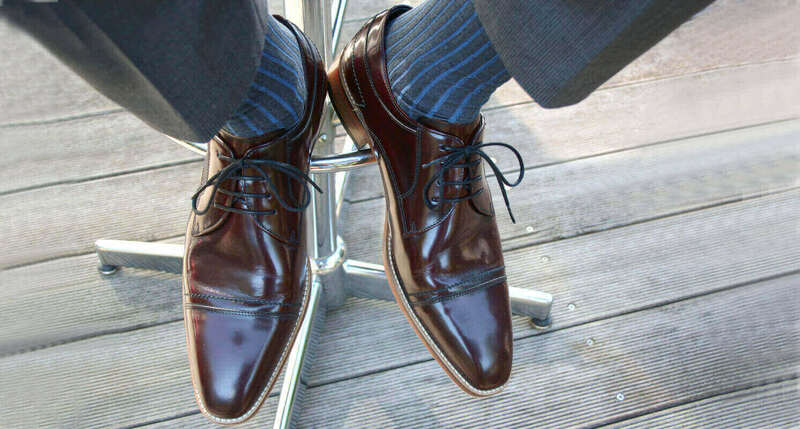 Whether you are looking for men’s business shoes in black, brown or cognac. Or even more specific colours like Bordeaux – you will find lots of individuality in this collection. You will receive your invoice as a PDF. If you would like to receive your invoice in printed form, please send an e-mail to > service@shoes4gentlemen.de . Our gentlemen shoes are mostly made of high quality leather. The upper is often calf leather. The inner lining and the sole are 100% natural / genuine leather. The high quality of leather combined with good care guarantees a long life of the shoe. Manufacturing Shoes 4 Gentlemen are manufactured by traditional manufacturers in Italy and Portugal. All business shoes are made of high quality leather. The upper used is mainly calf leather. The inner lining and the sole are made of 100% natural / genuine leather. This ensures a good fitting and comfortable wearing. Exceptions are the “Climate shoes”. On these models upper is made of canvas which contributes to a pleasant foot climate. Do you wish to be informed when new shoe models or collections arrive? 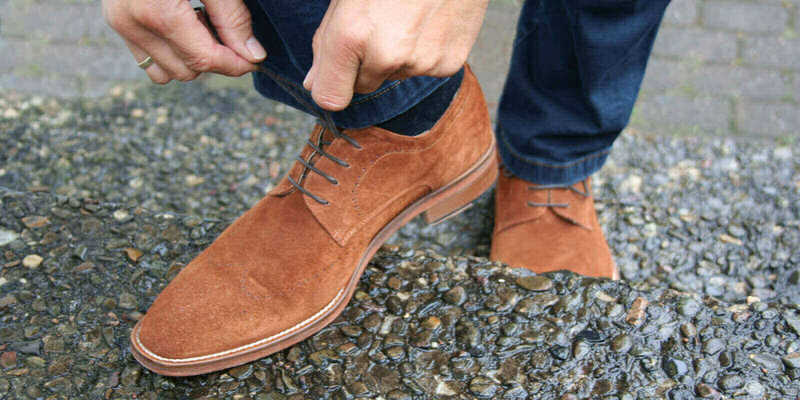 Shoes 4 Gentlemen only informs you when something is really “new” – No spam. Your package should be sent to a Paketstation (Package station)? When you enter your billing or delivery address at the beginning of the order process, please fill out the fields as follows: Package station number, first and last name and your DHL postal number. In the address fields, please enter the address of the package station. Shoes 4 Gentlemen delivers your shoes to your chosen Paketstation within Germany. There are currently three different payment options available: Credit card (Visa, MasterCard, AmericanExpress), PayPal and SofortÜberweisung. If a payment actually fails, errors are usually reported on the payment page. This could be caused by technical problems with the payment provider, with us or generally in the Internet. Please try again. Product description, price, material, fitting, photos and if your size is still in stock, please see product details. Quality and design should be more attractive than other men’s shoes in this price range. In order to achieve this goal, we design our shoes in Hamburg and all our men’s shoes are made by good manufacturers in Italy and Portugal with long tradition of shoe making. All produced in small, limited quantities and 100% genuine leather (upper, inner lining and sole). Only exceptions are the canvas “climate shoes” to avoid hot feet on summer days, but of course also made in high quality. You can comfortably shop around the clock – all week long. Whenever it suits you and you have 5 minutes. Avoid the annoying search for a parking spot and you do not have to wait for shop staff to serve you. You will be efficient and save time. An extra benefit of our exclusive business shoes: Especially all 2xx models (article numbers starting with a 2xx) can be combined very well with narrow trousers. Even a narrow cut lies elegantly on the shoe. Surely you know your shoe size. If you are not quite sure, here is a quick guide to the measurement: The easiest way is to draw your foot outline on a piece of paper and measure it in centimetre from the heel to the tip of the longest toe. So that your foot is comfortable – there must be enough space and your toe shouldn’t bump into the front when you walk. Add 1.5 cm to 2 cm depending on how tight you prefer your shoe to be. To convert your measurement into the standard shoe size system for Europe (“Paris Stich”). To do this, multiply the result by 1.5. Example: Your foot is 26.5 cm long + 2 cm extra space = 28.5 cm. Now multiply 28.5 by 1.5 and then round to the next size: 28.5 x 1.5 = 42.75 = shoe size 43.